Can the state build a better system to get your medical records to your doctors? Courtesy of Flickr user MC4 Army, used under CC license. Electronic medical records have become common, but the ability to share them easily between providers lags. Chances are, if you’re a patient in Connecticut, your doctor enters your medical information into a laptop or tablet and sends your prescriptions to the pharmacy electronically. But if you end up in an emergency room or go to a specialist unaffiliated with your primary care doctor, there’s a good chance your records will have to get there the old-fashioned way: by fax. And that’s if they get there at all. Connecticut doctors and hospitals have received close to $300 million in federal funds to adopt and use electronic health records, but the state still lacks a way to ensure they can be shared quickly and easily among medical providers. “The big problem is that we’re seeing all these different systems in the state, and offices and providers going to electronic technologies, and they’re not talking to each other,” said Lisa Freeman, executive director of the Connecticut Center for Patient Safety. “It’s something that’s very, very important for patients, and it’s really unfortunate that Connecticut is lagging in this because we’re doing so well with so many things,” she said. Connecticut’s lack of a health information exchange isn’t for lack of trying. Between 2010 and 2014, a quasi-public agency was tasked with developing one, using more than $4.3 million in federal funds. But the Health Information Technology Exchange of CT, known as HITE-CT, spent much of its existence in turmoil with its main vendor and never fulfilled its mission. Lawmakers last year eliminated the organization and handed its functions to the Department of Social Services, or DSS. Now some legislators are trying to restart efforts to create a health information exchange, motivated in part by concerns that the lack of a neutral, statewide system is not just hindering patient care but giving large health systems a way to squeeze out independent physicians and make it more cumbersome for patients to see providers in competing systems. A bill proposed by the Senate’s Democrat and Republican leaders as part of a package of hospital-related proposals calls for using up to $50 million in bonding funds to create a statewide health information exchange. It also takes aim at efforts to avoid sharing patient records, deeming certain moves to do so unfair trade practices. But DSS officials oppose the bill and say they’re taking another approach, focused on closing gaps that exist in the ability to share records rather than creating a new, large centralized system. And hospital officials have raised concerns about the proposal. 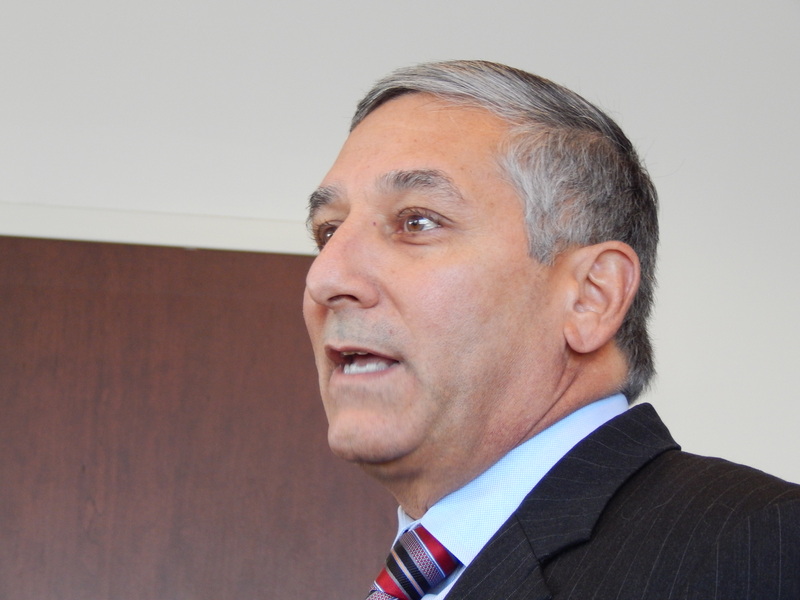 The Public Health Committee co-chair, Sen. Terry Gerratana, D-New Britain, said it might be a challenge to establish the groundwork for a health information exchange during this legislative session, which ends June 3. Rep. Prasad Srinivasan, R-Glastonbury, the only physician in the General Assembly, said a statewide information exchange is critical. In India, where Srinivasan grew up, patients bring their medical records with them to appointments. 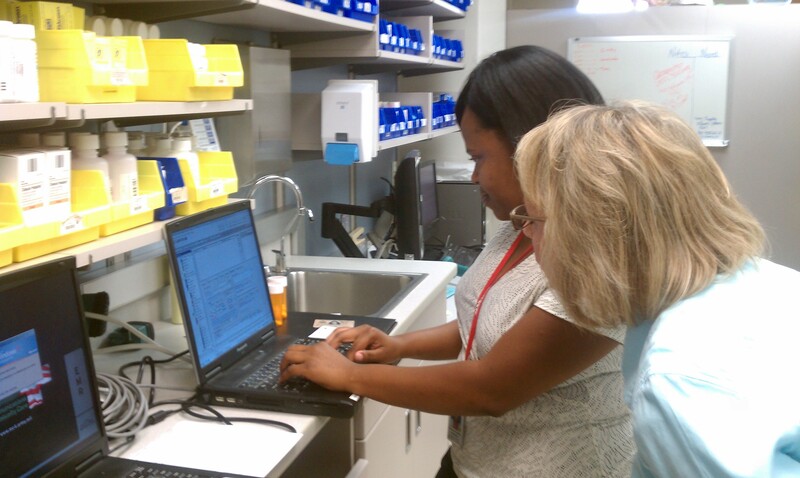 Proponents of electronic health records view them as a way to cut down on duplicated imaging and lab work, improve communication between providers and avoid errors like inaccurate medication doses. A 2005 analysis by RAND researchers projected that the widespread adoption of electronic medical-record systems that share data with each other could save the U.S. more than $81 billion per year through improved efficiency and patient safety. But last year, another RAND report noted that the early projections had not been achieved, hampered by slower-than-anticipated uptake, systems that weren’t user-friendly, and the inability of most systems to communicate with others — a function known as interoperability. “Many patients still come to the ER with a bag of medications, copies of paperwork, or a medical ID bracelet as their only form of health information,” the authors wrote. The federal government has poured billions of dollars into promoting the use of electronic records, largely through funding made available as part of the 2009 economic stimulus in a measure known as the HITECH Act. DSS has projected that more than 75 percent of Connecticut physicians will be using or implementing electronic records this year. But Senate Minority Leader Len Fasano, R-North Haven, who has raised concerns about the growth of large health systems that control multiple hospitals and physician practices, said he worries that the lack of a statewide health information exchange has enabled health systems to derive a business advantage by making it substantially easier to see providers that are in their system and use the same electronic records platform. For example, he said, if a patient needs to see an orthopedist, choosing one in the same health system as his primary care doctor would mean the specialist could easily access his records, while seeing an unaffiliated orthopedist could require him to bring his records on a thumb drive. “So there’s some swaying of patients toward [the system’s] doctors because of arguing it’s much easier and much better,” Fasano said. Federal officials in charge of health information technology have also cited concerns about barriers to sharing patients’ records. In a recent report, the Office of the National Coordinator for Health Information Technology described “information blocking” — knowingly and unjustifiably interfering with the ability of authorized people to access or exchange electronic health information. Examples include charging prohibitive fees to allow data to be shared or designing systems that make it hard to share records with competitors. “Allegations continue to surface that some health care providers and health IT developers are interfering with the exchange or use of electronic health information in ways that frustrate the goals of the HITECH Act and undermine broader health care reforms,” the report said. The Connecticut State Medical Society has also raised concerns about getting access to patients’ records. “Community physicians are routinely shut out from hospital [electronic medical records] systems and cannot access the information they need to provide the highest quality care for their patients,” the medical society said in testimony on the Senate leaders’ proposal. Officials at hospital systems, however, say they allow doctors to access patient records. Vin Petrini, a spokesman for the Yale New Haven Health System, said any doctor in the state can access Yale’s records system to find information on their patients who have been cared for at a Yale system hospital. Some Connecticut lawmakers are interested in Rhode Island’s health information exchange, known as CurrentCare. Patients there who give consent have their medical records flow into a central repository that hospitals and other health care providers can access. 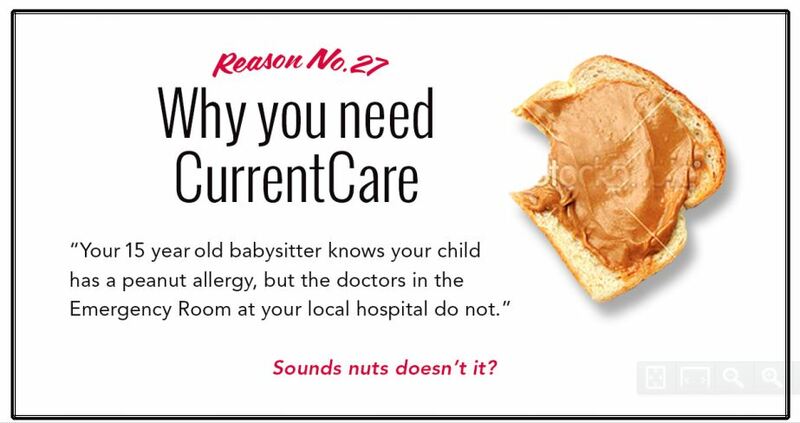 CurrentCare can also alert doctors if their patient shows up in an emergency room. 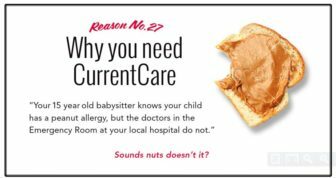 Laura Adams, who leads the organization that runs Rhode Island’s health information exchange CurrentCare, used this in a presentation to Connecticut lawmakers. A patient went to an emergency room with chest pains. It wasn’t the patient’s usual hospital, and the doctors didn’t have any of his records. An electrocardiogram suggested he was having a heart attack, so they gave him a clot-busting drug. But the man wasn’t having a heart attack — as the doctors would have realized had they seen his records, which would have made clear that that day’s EKG was not abnormal for him. The man actually had pancreatitis, and the drug he was given — appropriate for a heart attack, but dangerous for his actual condition — opened a bleed in his brain. Adams said an exchange can help prevent other problems, too. Data show that patients whose doctors got alerts on them through CurrentCare were 13 percent less likely to be readmitted to the hospital in 30 days, and 20 percent less likely to have a return visit to the emergency room, she said. Advocates for a health information exchange often point to the need for emergency room physicians to access patients’ records. Looney and Fasano are pushing for the creation of a neutral, statewide health information exchange like CurrentCare that would allow patients’ records to be accessed in real time by health care providers and patients. Their proposal also targets the practice of information blocking and concerns about records systems being used to disadvantage independent physicians. Most of those who have weighed in on the proposal say the goal of developing a way to exchange information statewide is a good one. But some disagree on how to do it, or on details in the proposal. The Yale New Haven Health System said in testimony that the proposal would create additional financial burdens for hospitals. “Rather than revamping a system that is already in place and working, we encourage the Connecticut legislature to collaborate with hospitals and other healthcare agencies to develop and build on best practices,” the hospital system’s testimony said. The Connecticut Hospital Association praised the goal of having a viable exchange, but raised concerns about some of the bill’s specifics, and suggested that it would require a push toward interoperability faster than what federal officials have suggested is possible. A new system or bridging the gaps? And officials at DSS, the agency charged with health information technology and exchange activities, are instead aiming to close existing gaps rather than building a new statewide system. For example, the department now offers a way for health care providers to securely send images, documents and other files to other providers. The “direct messaging” program is available to providers who weren’t part of other electronic records incentive programs, and can include doctors, hospitals, home health agencies and nursing homes. The program is small, with 71 providers signed up, but Minakshi Tikoo, who plays a lead role on health IT issues at DSS, said that’s to be expected, since thousands of other providers already have the capability through their own systems. “We’re just filling a gap,” she said. And while Rhode Island’s system has a centralized repository of health information, Tikoo said having records centralized has raised concerns in Connecticut in the past. She and Bremby cited an alternative method that would use a program that can go into each provider’s records system and search for a patient’s records, which would be retrievable if the patient previously gave permission for the records to be searchable. “I think Connecticut is farther along and more ready than people might be aware,” Bremby said. Adams said CurrentCare’s system could be scaled to accommodate another state. But she said some of the biggest challenges in developing an exchange lie not in technology but in getting key players to buy into the system and developing trust among those affected — things that require local leadership. Freeman, from the Connecticut Center for Patient Safety, said building a records exchange must be done right the first time. She noted that the records it would handle can be highly sensitive and must be secure. “I’m looking forward to seeing it come about,” she said. “But I also don’t want to see the process rushed just for the sake of meeting a deadline.